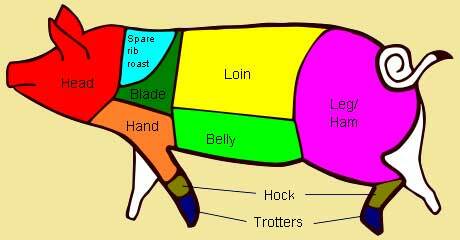 The art of choosing pork is to remember that roast pork is indigestible without its fat, and that crackling is one of the world's great joys. The pig is one of the oldest forms of livestock, having been domesticated from the wild boar. Prior to the advances in modern farming techniques in the Twentieth century, pork in Europe and North America was traditionally an autumn dish which is why in Western culinary traditions apples, harvested in late summer and autumn, have been served with pork. Apple sauce is perhaps one of the more common side dishes served with roast pork and there are many recipes which call for the cooking of the pork in cider. 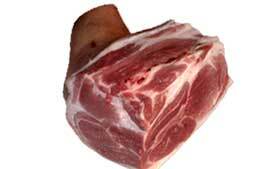 Pork is the most widely eaten meat in the world, although consumption varies widely from place to place. This is despite religious restrictions on the consumption of pork. It might surprise you to know that, per head of population, neither the UK nor the USA are in the top ten countries consuming pork. 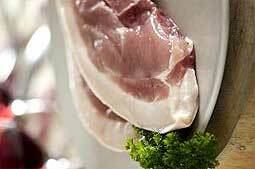 Pork may be cooked from fresh meat or cured meat, the most well known of which are ham and bacon. 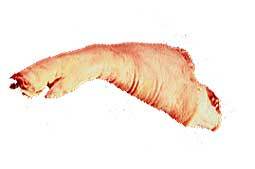 Pork is particularly common as an ingredient in sausages and many traditional European sausages are made with pork, including chorizo, fuet, and salami. 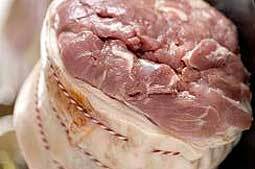 Traditionally considered a white meat pork is actually a red meat although its myoglobin content (which is responsible for making meat red) is lower than beef although far higher than the white meat of chicken chicken. 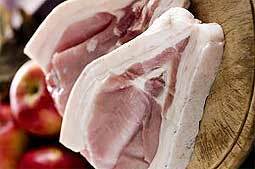 Pork is very high in vitamin B. 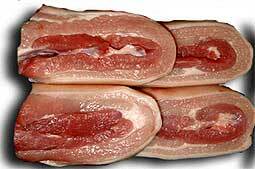 Throughout the Islamic world, as well as in Israel, the consumption of pork or any products containing pork are strictly taboo. 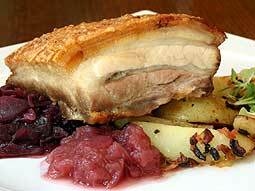 Pork is one of the best known foods of those that are forbidden under traditional Jewish dietary law. The biblical basis for the Jewish prohibition of pork is in Leviticus which says "Nevertheless these shall ye not eat of them that chew the cud, or of them that divide the hoof: as the camel, because he cheweth the cud, but divideth not the hoof; he is unclean unto you." 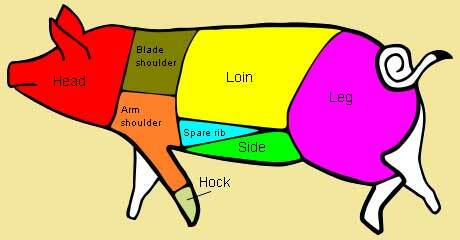 Cooking pork, like with other meats, is largely determined by the cut to be cooked. 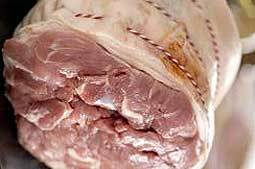 Cuts from the lower leg and shoulder, where the muscles have the most exercise, are likely to be tougher and are more suited to long, slow cooking, whereas cuts from the back tend to be lean and tender, making them ideal for quick cooking. A very tender cut, the tenderloin is the pork fillet. This cut is very versatile and can be stuffed, slow roasted, sliced or diced and is great served with apples, cider or mushrooms. High class roasting joint. Roast reasonably fast. Easier to carve than on the bone and the crackling is just as good. 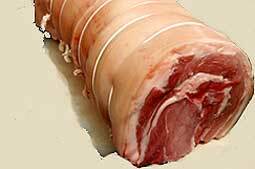 Great crackling, sumptuous hot and divine cut cold for sarnies or for lunch with pickles and salad. Pork legs make crackling to die for. Lean meat closer to the bone. The pork roasting joint of choice - fatter than the leg, and much sweeter. 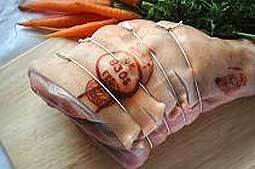 Roast slower, fantastic for crackling. This cut when rolled is great roasted with a fresh, homemade apple sauce. 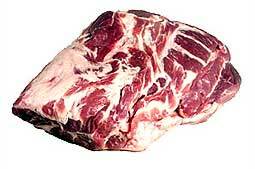 The rich fat in the belly keeps the meat tender and juicy making it very difficult to overcook. If cut into slices it can either be roasted or grilled. 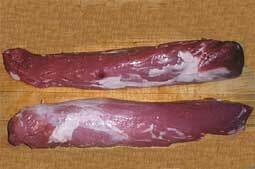 Very quick to cook, lovely lean meat cut from the loin. Grill. 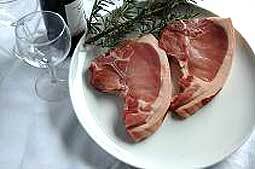 Boneless pork steaks, equivalent to the rump steak from a beef animal. Tender and juicy. 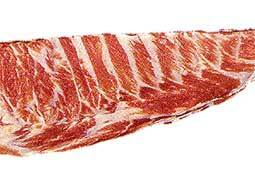 Cut as a rack of ribs these are fantastic chinese style or with a barbeque sauce. Cook slowly, great with wholegrain mustard. For the more adventurous cook, best cooked slowly.